We are open 7 days weekly from 9am to 4.30pm, also serving tasty cooked breakfasts, a selection of rolls, toasties, cakes, scones, sandwiches, paninis, baked potatoes, delicious home made soups and hot meals - there's something for everyone, sit in or carry out! Your Local Farm Shop Try our range of own grown and local vegetables, fresh and frozen fruit (raspberries, strawberries and brambles) and homemade jams. Pop in for fresh milk, pork from Puddledub Farm Fife, Aberdeen Angus beef or our own reared lamb. While you are in, browse our range of gifts, artwork, greetings cards and knick knacks or buy a bag of your favourite sweeties. Our stock is always expanding and changing with the seasons, so pop in regularly to see the latest offers. 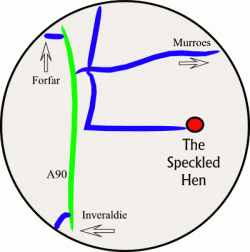 Book the Speckled hen in the evening for suppers, ceilidhs and community group meetings. 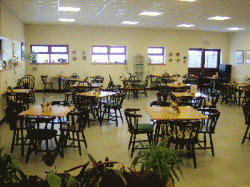 Excellent rates for room hire, food and refreshments, capacity seated is 60. Or ask for a free estimate for outside catering to your own event. 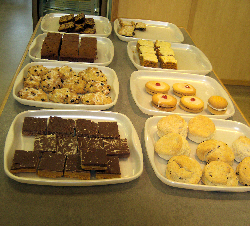 We deliver free in the Tealing area, finger buffets from £5 per head for a tasty menu of your choice. We can also do soup or stovie crocks if you want something a bit warmer and heartier! Call Heather on 01382 380255 to discuss your requirements.